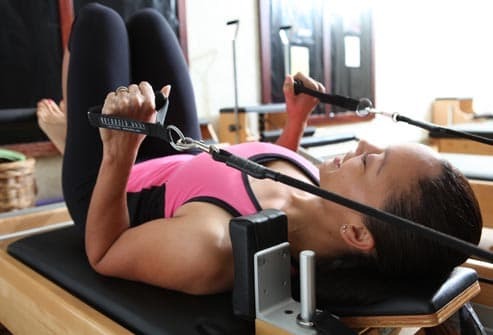 What sets Pilates apart is its focus on toning the muscles with springs, bands, or your own body weight. Alycea Ungaro, author of 15 Minute Everyday Pilates, shares her routine for beginners. 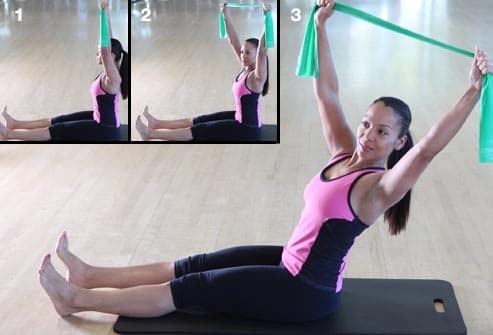 Some moves are shown using Pilates studio equipment, but you can do most moves at home. Check with a doctor first if you're a man over age 45 or a woman over age 55, or if you have a medical condition. Besides toning the muscles, Pilates is known for boosting endurance. A wall and small hand-weights are the only necessities for this highly effective exercise. Stand with your back against the wall and feet hip-width apart. Walk the feet out a little, bend the knees, and slide down as if sitting in a chair. Progress in intensity each day until you can get your upper legs parallel to the floor. Raise the arms to shoulder height and hold for 30 seconds. Do two reps. While the focus of Pilates is strength training, you'll get some cardio in with moves like this. Stand with your belly pulled in and your arms overhead. Inhale and lower your head, bending the knees and swinging the arms back. Exhale and jump up with straight legs, reaching the arms overhead. Land with the knees slightly bent and return quickly to starting position. Do 8-10 reps at a rapid pace. You should be out of breath when you finish.